This is one of the simplest and most nourishing recipes around. It only takes 10 minutes to put together and it’s wonderfully filling and comforting. It’s one of my go-to meals all winter. It’s a great dish to make if you’re feeding lots of people too as it’s no more complicated to make for twelve then it is for two. It requires almost no chopping, so you won’t be in the kitchen for hours! 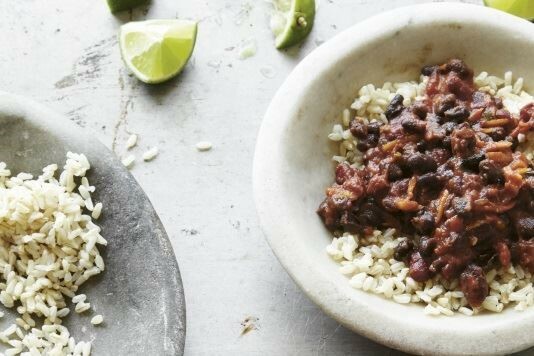 While you're cooking the chilli, boil brown rice to serve it over. Make extra batches of this and freeze them as it makes a delicious, filling meal when you don’t have time to prepare anything. Add the passata, tomato purée, both the beans, jalapeño pepper and the chilli flakes to the saucepan along with some salt and pepper, to taste. Cook the chilli for about 10 minutes, stirring it well, until it’s lovely and warm and everything’s nicely mixed together. Pour the chilli over brown rice and enjoy.